Add the garlic, oil, and poultry seasoning to a pan and heat for 1 minute or until warm. Make shallow slits down the length of each chicken breast about ½ an inch apart. Place the chicken in a zip lock bag and pour in the warmed oil. Seal and refrigerate for at least 4 hours. When ready to cook, remove the chicken from the fridge and allow to reach room temperature. 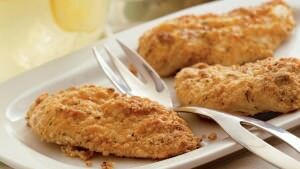 Combine the breadcrumbs and parmesan in a dish and press each breast in to generously coat. Spray a baking dish with cooking spray and add the chicken. Bake until the chicken is cooked through, about 25 to 30 minutes depending on breast size.